Believe it or not, it has now been 50 years since Honda began its operations in Canada. 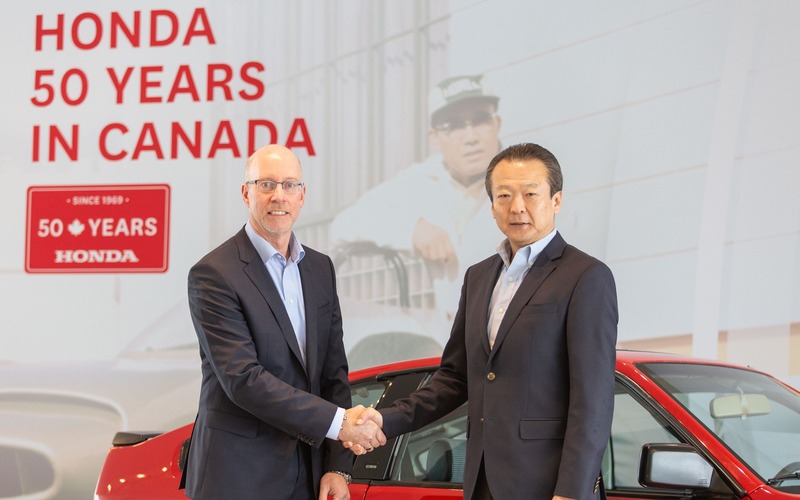 To mark this important milestone, a special ceremony took place at the company’s head office in Markham, Ontario, where Honda North America Chairman and CEO Toshiaki MikoShiba and Honda Canada President and CEO Dave Gardner addressed the crowd of employees on hand. The Japanese manufacturer, who was the first to build cars in Canada, ranks among the most popular makes thanks in large part to the quality, reliability and fun-to-drive characteristics of its models. And there’s no better illustration of that than the love story between Canadians and the Honda Civic, which has been dominating car sales in the country for the past 21 years. Did you know that Honda Canada has sold more than four million vehicles since incorporating on March 11, 1969? Four years later, after making a name for itself with motorcycles and power products, Honda sold its first Civic. During the following decade, in 1986 to be exact, Honda opened its first plant on Canadian soil, namely in Alliston, Ontario, to produce the Accord sedan. In 1998, a second plant was brought online at the same site to build the Odyssey minivan, and in 2008 a third facility began assembling four-cylinder engines. Through an $857 million investment in 2015, Alliston became the global lead plant for the tenth-generation Civic. Overall, more than eight million cars and light-duty trucks for Canada and other markets have been manufactured over there. Today, with the help of nearly 19,000 employees, Honda Canada operates two car plants (producing not only the Civic sedan and coupe, but also the Honda CR-V), one engine plant, various sales offices and a national network of more than 600 auto, motorcycle and power equipment dealers. Honda’s 2019 lineup includes 11 different vehicles, from the Fit subcompact hatchback to the Ridgeline midsize pickup to the freshly introduced Passport SUV.